When you live in Colorado and your family lives here in Raleigh, pictures have a special meaning. When you are moving to Germany, they become extremely special. With the last of the fall colors cloaking the ground, Historic Oak Grove Park, off Poole Road in Raleigh, made great and memorable backdrop for this family engagement. The couple's daughter contacted me to do pictures while she and her husband were down for their Christmas visit and the time was brief to get them done. She had grown up going to this park, so it made for a nostalgic backdrop for the photography session. My client asked for this shot of her, her mom, dad and brother and the fall canopy from the park to the stone bridge made the perfect location. 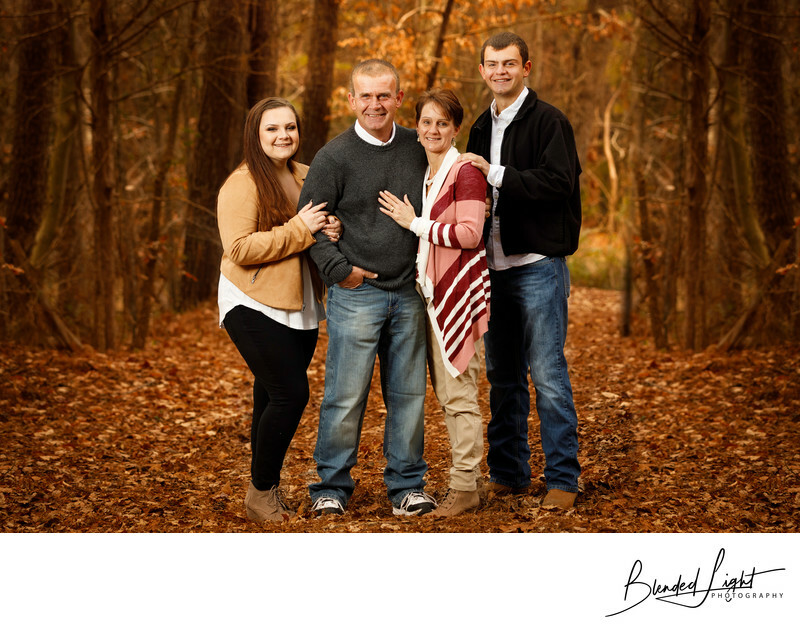 With the diffused light coming from the sun on this cloudy day, my off camera flash provided the illumination for the family. With a small family like this one, posing is fairly easy. I like to have mom and dad in the middle with the son beside mom and daughter beside dad. You could easily reverse this, but I feel like this way gives a little more balance to the image rather than appearing to grouped by male and female. You'll also notice that this posing creates a more balanced picture with regards to heights. We've separated the two tallest and the two shortest and balanced out the height differences nicely. But the absolute key to this image is the connection the family shows. Everyone, smiling, everyone touching someone. Connection (and showing it) is the key to creating worthwhile family images. If, as a family photographer, I make an image where no one is connected, then I have failed. The act of touching can be as simple as holding hands, interlocking arms, a head on a shoulder or a hand on a knee. I'm not talking complicated stuff here, just natural everyday gestures. In the absence of touching, connection can be derived through smiles and looks. Staring into someone's eyes with a beautiful smile on your face shows just as much connection as handing hands. Oak Grove Park, literally on the corner of Poole Road and 440, is a unique farm just outside the belt line in southeastern Raleigh. With old restored farm houses, a cotton field, a small vineyard and a pecan grove, the park is a reminder of North Carolina's history as an agricultural leader and is a beautiful location for any number of photography engagements, ranging from family and seniors to bridal and engagements. The tall pecan trees on the hill surrounded by bright green rye grass give a great pop of color even on the darkest of winter days. And if you look close, you might just find some leftover pecans. As an added bonus, kids always love the park's farm animals when they are out of their cages. Goats and chickens are the norm, with some Canada geese snuck in for good luck. Such a beautiful and fun Wake county family in one of Raleigh's most known public parks. Location: 4028 Carya Drive, Raleigh, NC 27610. 1/160; f/4.0; ISO 400; 100.0 mm.